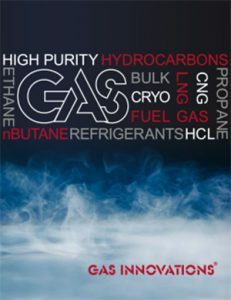 GAS INNOVATIONS Introduces New High Purity Hydrocarbons and Refrigerant Gases Brochure complete with the latest packaging capabilities. This new literature features Bulk Capabilities from Compressed Gas Modules, Ocean Going ISO Containers, Cryogenic Containers, Low Pressure Cylinders and Disposable Cylinders. For more info click here.